This photograph represents Lorenzo Dow Lewelling (1846-1900). Born and raised in the Quaker lifestyle in Iowa, Lewelling moved to Wichita, Kansas in 1887, after working a variety of jobs and serving in the Civil War with his second wife and child from his first marriage. 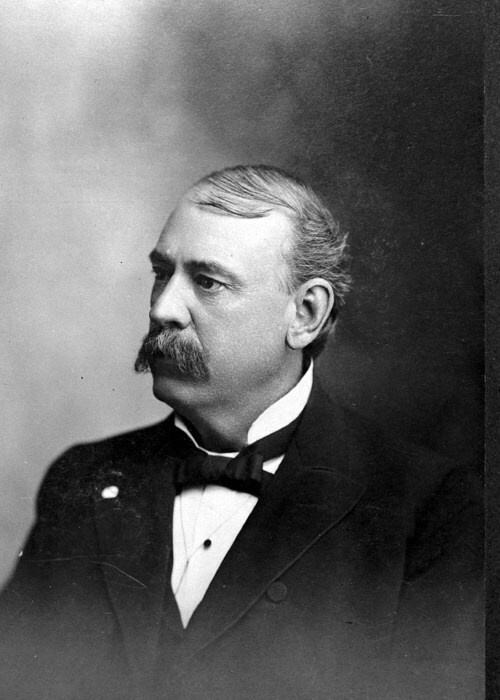 As a founding member of the Farmers' Alliance, Lewelling ran as a Populist for the 1892 governor's race. Notable events during his administration was the "Populist War" in 1883, clash with activist Mary Elizabeth Lease over the fusion of the Populists and Democrats, and removing Lease from her position as President of the Kansas Board of Charities. Failing to be re-elected as governor, Lewelling was elected to the Kansas State Senate, a position he held until his death. This image can be grouped with sources dealing with the Populist (or Legislative) War, including images of the statehouse, the executive orders that Lewelling issued during the standoff, the statement of the Republican House, Floyd Bull's reminiscence, E. Spencer's travel pass, and the copy of the agreement between the two groups. Furthermore, his strained relationship with Mary E. Lease can be used as an example of how the fusion of Populists and Democrats alienated Lease and eventually led to the demise of the Populist Party.